Chicken keeping in extreme winter weather. Surviving power outages and ice storms. This past week winter storm Avery ascended onto our area and knocked out power for almost 6 full days. My chicken farm was without power from Thursday night till Wednesday afternoon. Even though it started with freezing rain, had several days or snow and sleet and barely got above freezing the whole week....my chickens did just fine throughout out the entire winter storm. Don't get me wrong, it wasn't easy! Just when we thought the weather was warming up, it started to rain which quickly coated the chicken coops in a new layer of ice. The trees that hadn't lost their leaves yet cracked and fell under the weight. The chickens were unfazed by this severe weather though as thankfully, we were well prepared! 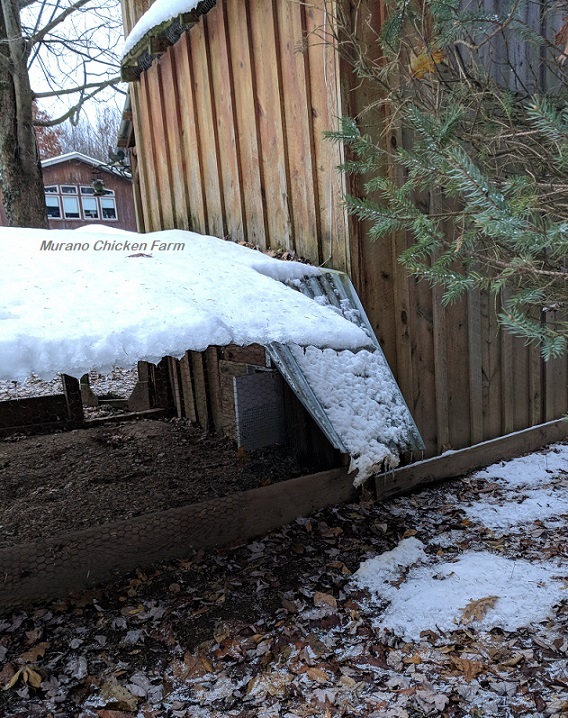 Although my preps and a few tricks during the storm definitely helped the chickens to survive and even thrive during this extreme winter weather, most of the credit goes to one main practice I always follow. If I had used heat lights or heat panels in my coops, my chickens would have been used to the warmer temperatures and the sudden drop in temperature would have been very hard for them to handle. Since they had become acclimated to the cold weather gradually as the season changed, they didn't even notice when the electric to their coop went out. Of course I noticed the power outage because fresh (liquid) water became a bit of an issue, but the temperature did not faze the chickens in the least. Here are the other tricks the chickens and I used to get through the winter storm and power outage. Provide fresh water daily: If you lose power like we did, giving the chickens fresh water each day ends up being harder than you think! You may have to buy water by the gallon and keep it inside the house. I left buckets under the downspouts on the house and coops to catch water from melting snow each day when the sun was out. Buckets of cold water can be brought inside the house to prevent freezing. Even the coldest rooms of the house stayed warm enough for the water to not freeze overnight. You could also put a bucket of snow or ice water in a closed car in direct sunlight. The temperature inside a car in direct winter sun can be considerably warmer than the outside. The thick black rubber stock tanks or buckets left in the sun will often warm up enough to melt a bit. You might have to do a little 'hold the ice and pour off the water' type of thing but it works to get the chickens drinkable water. I have a black rubber tub from the feed store that conducts heat really well, so we left it in the sun to melt each day. There are a few other tricks you can try as well. Lisa from Fresh Eggs Daily floats ping pong balls in her water tubs to keep the water from freezing as quickly. Staci from A Chick and Her Garden uses a soda bottle of saltwater to keep her chickens water from freezing. Full disclosure: that one didn't work for me but I've heard it does work for some people so it's worth a try. Give calorie rich treats: Feed the chickens extra treats like my easy 'suet' cakes, black oil sunflower seeds, cracked corn or scratch grains to help your chickens keep warm naturally. I throw out an extra handful of cracked corn right before bedtime to help fuel them through the long cold nights. Put down extra bedding in wet areas: As snow is melting the ground near the coop can get pretty wet. In our situation it often started to melt during the day only to freeze again at night. Cover wet paths around the coop with an extra layer of bedding like wood shavings, straw, hay or dried leaves. 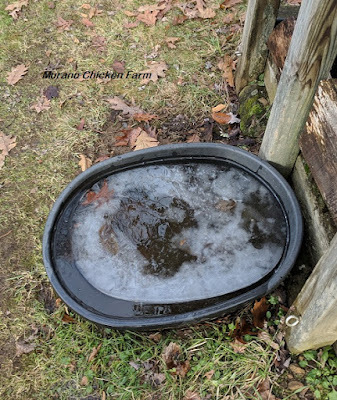 The chickens will naturally stay warmer if their feet are dry and keeping their feet dry also helps prevent frostbite on their toes. Check the coops for storm damage often: Make sure you clear snow off of the roof or covered run. In our instance freezing rain started the whole thing and snow just added to it. Wet snow and ice are very heavy and can damage your coop, or in my case the run. Luckily this was only the overhang at the end of the run but it could have been worse. Trim dead branches and trees: Remove dead branches and cut down dead or diseased trees near the coop as part of your pre-winter maintenance. This is much easier to do on a nice day than in the middle of a storm. Plus, it's easier to see which trees aren't healthy when the healthy ones still have leaves. Insulating the coop: I installed permanent insulation in some of my coops but temporary insulation can be thrown up in a pinch. I use towels, but many people use cardboard or straw bales to insulate their chicken coop. One of my neighbors staples feed bags on the walls inside her coop every year to prevent drafts in winter and she swears by it. Chickens in a draft free coop are naturally warmer, but make sure you don't block necessary roof level ventilation. Stock up on food and bedding: I often talk about stocking up on feed to save money, but having extra feed on hand during the winter season insures that if the roads are blocked or the stores have lost power along with you (even our Walmart lost power for 2 days!) then you won't run out of feed at an already dangerous time for the chickens. You may want to buy a few gallons of water to keep on hand also, for you and the chickens! Make sure your coop is adequate: Some smaller or premade coops are not sturdy enough to withstand heavy winter snows and some are not draft free. While these may be perfect for warmer climates, they may need some help to get through winter storms. In Winter Chicken Coops: the Good, Bad and the Ugly! I evaluate different styles of chicken coops based on winter weather. Making sure you have a coop that works for your climate will keep your chickens more comfortable in extreme winter weather. I know a lot of chicken keepers want to heat their coops because they worry about the chickens being cold. I get it, I was like that when I started keeping chickens too! I used to have a heat source in my coop and ironically I lost a few birds to what I thought was cold each winter. Over the years I have changed my approach to one of allowing their bodies to acclimate themselves to the cold gradually and I haven't had any of those sudden winter deaths since then. Last year I was curious as to how cold or warm my chickens really were in winter. I used a temperature gun to test the chickens body temperature at skin level. You can watch the video in the post Are Your Chickens Warm Enough? and I think you'll be surprised just how warm they really are. I know I was! Heat and light are not the same. I don't add light to the coop to force the hens to lay in the winter months. While lights don't have the same effect as heat does, the loss of electricity would have plunged the chickens into 9 hour days. This sudden change would have been a shock to their systems if they were used to the 12-14 hour days that are optimal for laying. While I don't think a sudden loss of artificial light in the chicken coop would have affected their tolerance of the cold or how the chickens came through the winter storm, it would have thrown off their laying pattern again. A hen's body is meant to gradually slow down or stop laying eggs as the days grow shorter after the summer solstice then gradually start laying again when the days grow longer after the winter solstice. Obviously artificial light alters that natural pattern and a power outage would interrupt that further. However, I don't think it would be harmful unless the lights added to the coop were also adding heat. Thankfully the storm has passed, electricity has been restored to the water bowls and all is back to normal in the chickens little world. While the storm made a lot of extra stress and work for me the chickens lack of reaction to the whole episode makes me wonder...did they even notice? Need more information on cold weather chicken care? Check out all my posts on raising chickens in winter! Nice, informative article! Would it work for quail? I have four bobwhites. I also have a small portable cage to transfer them to the laundry room on the porch would be similar to being inside. Usually in Feb, it hits teens for a week or two. First year for quail.now, outside with blanket around and top with open area for heat light. Inside pine shavings. I thought they'd cuddle, but all are in a circle with tails to inside. Weird! Only use light at night for now. Open up for day and sun. Good diet. Thank you! I don't see why the same things wouldn't work for quail. They are as cold hardy as chickens are and should do just fine in a draft free coop for winter. What do you do about frostbite on combs? I lost a rooster to the effects of that last year and felt terrible. Rooster combs are very susceptible to frostbite! I give complete instructions for treating frostbite here: https://www.muranochickenfarm.com/2018/01/how-to-treat-frostbite-in-chickens.html To sum it up, apply a salve to the affected area to help it heal. Make sure moisture in the coop is not an issue and if it is, replace the damp bedding with dry bedding. Hope that helps!